TransCube is back and ready to take your film to even greater heights! TransCube Volume 2 from Pixel Film Studios takes cube transitions a step further with over 50 styles and full customization controls in FCPX. TransCube Volume 2 will have your films transitions exciting from beginning to end! 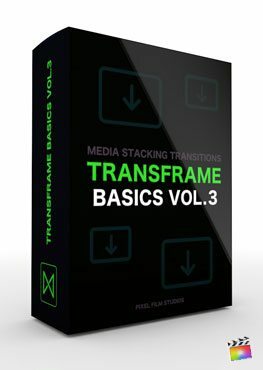 With over 50 unique and customizable styles, TransCube Volume 2 is another addition to a useful and valuable set of tools for any film maker using FCPX! Each style has unique animations and settings, giving each transition its own personality but can also be altered to fit any films style! TransCube Volume 2 comes with multiple rotation presets but can also be changed by the film maker with a few clicks of a mouse! Horizontal and vertical flips and rotations are all selectable and useful to meet and exceed any films style! Each transition in TransCube Volume 2 comes with multiple color controls, giving you even more control over how each transition looks and feels. All the color controls are selectable in the FCPX inspector window and can be change on the fly! TransCube Volume 2 was designed by Pixel Film Studios to work within Final Cut Pro X. Each transition is applied between clips, and all attributes are accessible within the FCPX Inspector window. Stretch out your transition to be the perfect length, and begin customizing to make each style your own! Where do I find ProTrailer: Network? Once the installation is complete, you can find TransCube: Volume 2 in the FCPX Transition library.